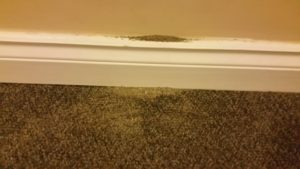 A condo inspection in West Vancouver noted evidence of pest activity in the hallway. The building super was notified to take action. Condo inspections have two parts to them, first the owner’s apartment and second, the common areas. By the way, EKAN recommends that both areas be inspected, in spite of some building inspectors giving you the option to do only the apartment. We will not do only half the job! In this particular case we noticed fine sawdust on the baseboard at the floor level. Hmm. Looking directly up the wall, there was a ventilation grill near near the ceiling with a few more traces of fine particles. We do not do pest inspections or identification. But from our experience it looked like industrious carpenter ants were present behind the grill and busy making tunnels in the dry wood and cleaning house by throwing the cuttings out through the grill. The building super was notified to take action. It is important to deal with any infestation immediately to contain and eliminate the cause before any structural damage or health issues arise. Shortly after this finding we contacted the property management firm with our observation and we received feedback that the issue had been looked after.